Every year, hundreds of thousands of women around the world die avoidable deaths during childbirth, for lack of skilled birth attendants and basic medications, the international medical humanitarian organization Doctors Without Borders/Médecins Sans Frontières (MSF) said in a report released today, in advance of International Women’s Day on March 8. The report “Maternal Death: The Avoidable Crisis” details how the provision of emergency obstetric care to pregnant women in acute and chronic humanitarian crises can have a direct impact and save women’s lives. It examines the circumstances for pregnant women in 12 countries where MSF works, in settings ranging from conflict areas to countries with weak health systems, including Pakistan, Somalia, South Sudan, and Haiti. The report highlights the need for emergency medical assistance, particularly when pregnancy complications occur. The report draws on years of MSF’s experience running and expanding programs to meet the needs of pregnant women, and seeks to draw greater attention to the dearth of emergency obstetric care in a number of crisis areas. Every day, approximately 1,000 women die in childbirth or from pregnancy-related complications – one every 90 seconds, according to the World Health Organization. However, with the help of skilled birth attendants and access to the appropriate drugs and equipment, women’s lives—and the lives of their babies—can be saved. Delivery is the most critical moment for saving women’s and babies’ lives, with most maternal deaths occurring just before, during, or immediately after delivery, often from complications that cannot be predicted ahead of time. Typical—and deadly—complications include hemorrhaging, sepsis (infection), unsafe abortions, eclampsia (hypertension), and obstructed labor, which together account for nearly three quarters of all maternal deaths worldwide. All of these conditions can be prevented or treated. As an emergency medical organization, MSF has demonstrated that maternal deaths can be reduced, including during humanitarian crises. The organization has invested significantly in developing the technical and logistical capacity to provide life-saving—and free-of-charge—emergency obstetric care. 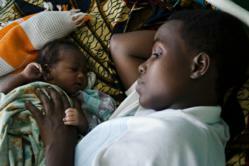 MSF provides emergency obstetric care in approximately 30 countries. In 2010, MSF staff assisted the delivery of more than 150,000 babies.